Elle est tres belle, n’est-ce pas? Modifications: I made the scarf a bit wider by increasing until I thought it was about time to stop; it’s about 23 inches wide, give or take. 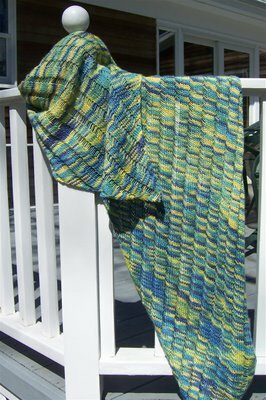 I also made it longer by delaying the decreases until I had just about 150 yards of yarn left; it’s 78 inches long after blocking. Comments: Sundara is a Yarn Goddess. Incredible! And it has such a perfect “east coast” feel in the colors and the way it is flung over the porch railing. Don’t know if that was what you were going for, but either way, it’s gorgeous. Wow! I love it. In the close up, the yarn just looks so amazingly shiny and sleek and soft. Yum. You ARE bringing it Thursday right? Can I try it on pretty pretty please…..
Oh, so amazing! 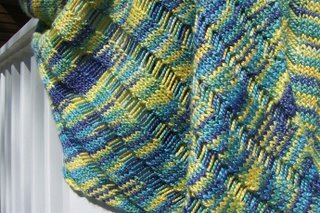 You really could not have done anything more perfect with this yarn! I so hope you enjoy wearing it! Beautiful – the yarn could have been made for this project, she is indeed a goddess 🙂 And you are a pretty nifty knitter yourself. It’s beautiful!I’ve been holding off on knitting it, but yours is inspiring. Oh Jane – all that fiberly goodness is awesome! Shazaamm.. I wish I could touch thru the computer screen… congrats on a beautiful project ! Yes, she is very beautiful, Jane. And looks like you will be wearing the scarf soon as it is Spring going into Summer colors. Gratz en finis. <– bad mix of foreign words there, but I tried. I am a Bohemian tinker.